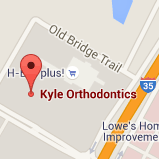 Serving the Kyle and Buda, TX communities with state-of-the-art orthodontic care, Kyle Orthodontics is here to make you smile! With years of training in all aspects of orthodontic treatment, Dr. Alexis Tessler creates beautiful, healthy smiles for children and adults while building trusting, meaningful relationships with those in her community. As a specialist in orthodontics, Dr. Tessler can provide the highly customized, personal care that you and your family deserve when it comes to your smile. Using highly advanced orthodontic treatments, like Invisalign® and Invisalign Teen™, as well as traditional metal and clear braces, your new smile will not only look amazing, but will have optimal function as well. Please feel free to contact our brand new, modern office to schedule your complimentary consultation with orthodontist Dr. Tessler. We look forward to meeting you and joining you in your exciting orthodontic journey! Call today to schedule your Complimentary Exam. We are conveniently located in Hays County in Kyle, a short drive from San Marcos, Lockhart, Buda and Wimberly.